Dope! Tight! Sick! Fresh! Ill! Magic! Classic! It's Acey droppin' heat on our brains. 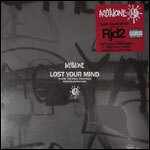 Lost Your Mind' produced by RJD2. Lyrics by Aceyalone. 'The Saga Continues' featuring Abstract Rude and produced by Fat Jack.